Wildlife species are exceptional animals that transform (with the help of micro- organisms in the rumen) any form of digestible matter or flora into a source of nutrients. It is widely known within the science of animal nutrition that ruminants and non-ruminants have different needs in terms of the sort of matter needed in their daily intake. In the wildlife industry, browsers and grazers add another dimension to this complex symbiotic relationship. It is clear that a higher quality feed that is more and easier digestible leads to better animal performance. Lucerne hay is one of South Africa’s most important sources of roughage and is used in a wide variety of animal feeds, but most importantly within the milk industry. In the last number of years, lucerne hay played an important role in relieving the effects of drought in South Africa – especially in the wildlife industry. The quality of lucerne hay is determined by a number of factors, such as climate, ground, fertilizer, water, cutting date and the hay-making process. Many factors contribute to the quality of lucerne hay, but traditionally it has been evaluated on visual inspection (subjective) where colour and leaf content are the most important criteria for quality evaluation. There are elements that cannot always be seen with the naked eye but do affect the digestibility of lucerne hay. Lucerne hay plays an integral part in the feed industry of South Africa because of its wide usage in ruminants like beef cattle and sheep. The dairy feed industry utilises a large proportion of the lucerne hay crop, and its nutritive value is therefore very important. The quality of lucerne hay can vary considerably in accordance with the many factors influencing it. This variation in quality hampers the efficient utilisation of lucerne hay in animal diets. One of the major problems in the lucerne hay industry used to be the lack of a uniform national grading system. This and many other factors have led to the stagnation of prices paid for lucerne hay, resulting in its value to be totally underestimated in the past. There are various methods available globally for the evaluation of lucerne hay quality. In 2008, a grading system specific for South African lucerne hay was developed that is managed by the National Lucerne Trust (NLT) in South Africa and governed by the National Agricultural Marketing Counsel (NAMC). The system is widely recognised and successfully implemented in the animal feed industry. The protein found in lucerne hay has always been the measure of a good quality product, but research has shown a low correlation between CP content in lucerne hay and animal performance. The fibre content, more particularly the digestibility of fibre, is an important sign of good quality in lucerne hay. Variation in the chemical composition of South African lucerne hay was illustrated in a study conducted by Dr Gerrie Scholtz at the University of the Free State. Variation in the quality of South African lucerne hay could hamper the accurate formulation of diets for ruminants, especially dairy cattle. In this study, comparisons are made between different variables within the chemical composition of lucerne hay to determine variation between the chemical composition and milk production of dairy cattle. Acid detergent fibre (ADF), ash and lignin were found to be correlated with milk production, with ADF and lignin being the highest components. The combination of variables (ADF, ash and lignin) proves to be highly successful for increasing milk production; this formed the basis of the New Lucerne Quality Index (NLQI). Although the model was developed on potential milk production, ranking of the index is based on digestible energy content or production potential. This will be universal among all species that utilise lucerne hay. In 2001, a decision was made that the NLT will be responsible for the lucerne seed and lucerne hay industries including the management of the statutory levy as published in the Government Gazette No. 38189 of 14 November 2014. The NLT in collaboration with various role-players including ministry is responsible for the overall upkeep of the lucerne hay grading system. 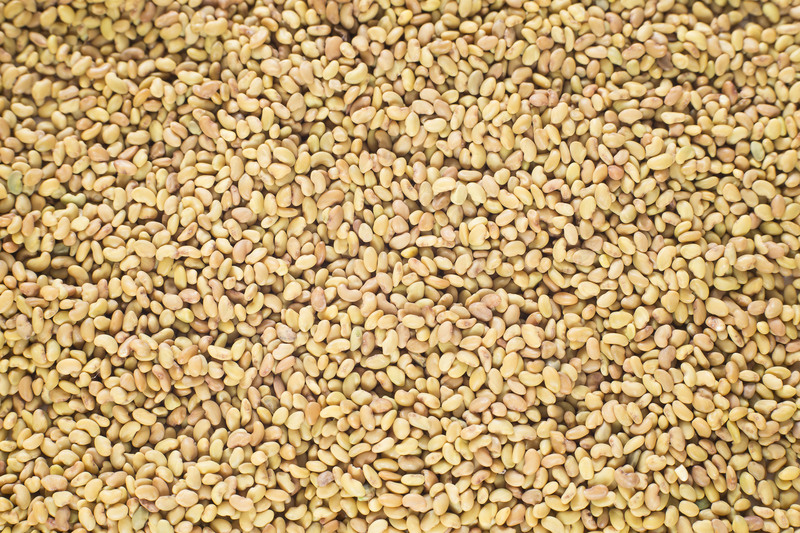 Lucerne hay is graded by making use of a Near Infrared Spectrometer (NIRS) which collects an image of the lucerne hay sample matrix and compares it to a database of a physical wet chemistry result database within the calibration. The New Lucerne hay Quality Index (NLQI) is used to determine the analytical grade of lucerne hay by predicting moisture-, protein-, ADF-, NDF-, ash- and lignin content, but only ADF, ash and lignin are used in the final calculations of the grading process. The NLQI multiple linear equation explains 96% of the measured variation in production potential. A representation of grades of lucerne hay and NLQI values are shown in Table 1. The grading of lucerne hay is twofold; objective evaluation (analytical) and subjective evaluation (visual). Both are used in combination to correctly grade the quality of lucerne hay. The aim of a grading system is to protect the producer and consumer by providing structure to the market. In principle the same structure is applied to the lucerne hay industry; the producer wants to produce a high quality product and hopes to be compensated accordingly. On the other hand, the consumer wants assurances that he is receiving value for money. It is important to understand and recognise the different grades of lucerne hay and the specific application of each grade. Dairy farmers need lucerne hay with a very high quality for their cows in order to produce and sell a suitable product. Animals that are only fed a maintenance ration do not have the need for lucerne hay of a superior quality to fulfil their nutritional needs. High quality lucerne hay can be used in combination with lower quality lucerne hay and even other lower quality roughages to supply the specific needs of different applications and species accordingly. Not only does the end user promote better production by buying good quality hay, but it replaces expensive concentrates and can thus lower costs even further. The financial advantage of grading lucerne hay cannot be over-emphasized. The NLQI is therefore a valuable aid to assess the quality of lucerne hay accurately according to animal performance. The impact and uses of different lucerne hay grades in the wildlife industry The use of lucerne hay especially in the exotic game industry has increased dramatically over the past few years. Although supplementation has become a daily routine for these species, the complexity of maintaining an ecological stable environment cannot be undermined, especially when ranched together. Different species have different nutritional requirements with regards to their physiological stage (maintenance and reproduction, etc.) Grazers (blesbuck), browsers (kudu) and hindgut fermenters (rhino, zebra) all require different nutrition in different forms. The NLT grading system is a very useful tool in assisting your animal nutritionist when formulating supplemental diets for these species. It is important to have a fair knowledge of lucerne hay’s nutritional values when rations are worked out. Very high quality lucerne hay can lead to mortalities if not used correctly, whereas low quality promotes low performance in especially pregnant and lactating animals. Consult your nutritionist when buying lucerne hay. Lucerne hay plays an important role in the nutrition needs of ruminants, whether domesticated or wildlife species. Research has revealed significant differences in the quality of lucerne hay. There is more to consider than just the colour of lucerne hay. This was a driving force behind the implementation of the NLQI to standardise the lucerne hay grading system and provide quality standards for the producer and end consumer. By using better quality lucerne hay, the end user not only increases potential production or animal performance, the financial implication is significant savings in cost on concentrates usually included in balanced diets. The NLT encourages the consumers of lucerne hay to demand a NLT lucerne hay grading certificate to assure they get the quality they pay for.